Event planning is a core service for public relations firms. 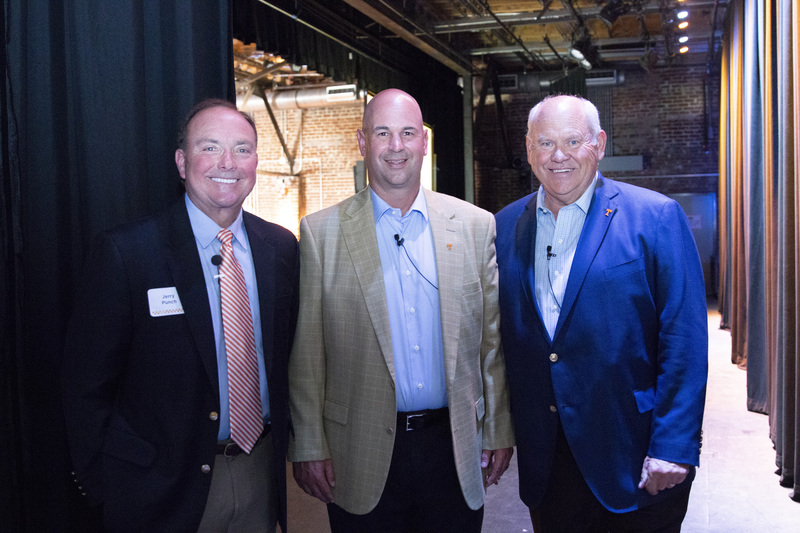 Moxley Carmichael executed the turnkey reception for the University of Tennessee’s Phillip Fulmer and Jeremy Pruitt – and, as always, the interns were drafted into service to assist with everything from invitations to parking to name tags. The firm wants its interns to gain real-world experience and not only see but also participate in a large-scale event. It is instructive, too, for seasoned planners to see the event through the eyes of first-timers. 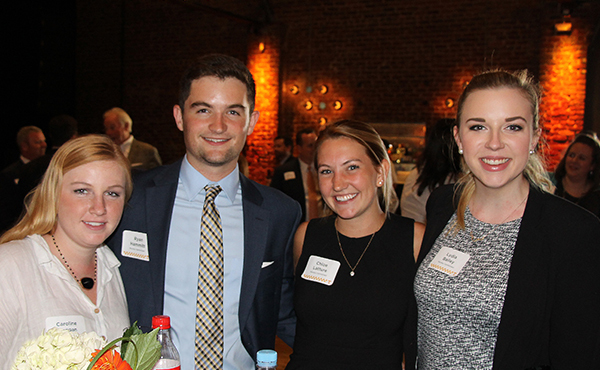 Interns, from left, Caroline Duggan, Ryan Hammitt, Chloe Latture and Lydia Bailey get together after completing their assignments at the official reception for Director of Athletics Phillip Fulmer and Coach Jeremy Pruitt. 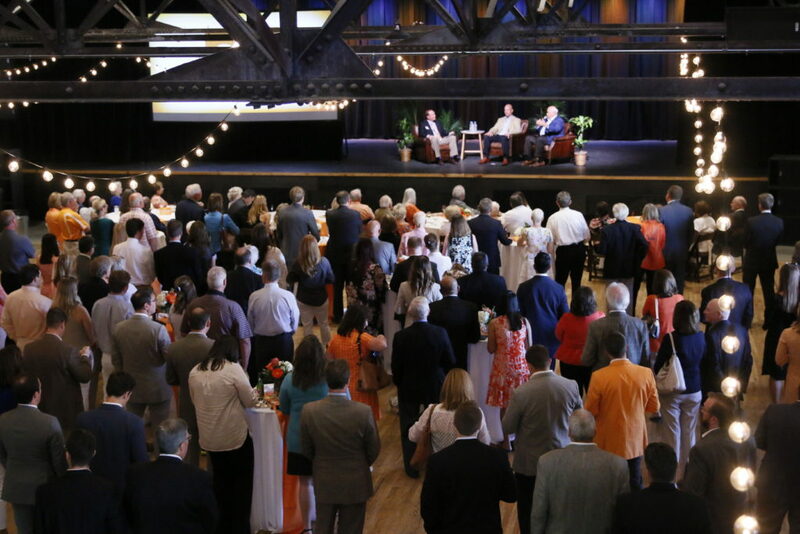 So, we asked the interns at Moxley Carmichael to share what they learned about the event held in May at The Mill & Mine to officially welcome Fulmer, the new director of athletics, and Pruitt, the new football coach. All four interns are pursuing college degrees in either marketing or public relations. For Ryan Hammitt, the reception coincided with his first day on the job as a summer intern. Hammitt, a senior at the University of Tennessee, drew the assignment of directing vehicles to a nearby parking lot and then working at the event entrance. He had to get up to speed quickly. From left, Dr. Jerry Punch, a longtime broadcaster, Coach Jeremy Pruitt and Director of Athletics Phillip Fulmer, stand backstage before holding a question-and-answer session with guests. Chloe Latture had been a spring intern and was held over an extra week, so she could work at the reception. Latture had been part of the overall planning process from creative ideas for the invitation to the time-consuming – but vital – task of handwritten addresses on the envelopes. Latture, a rising senior at UT, also noticed the staff-wide effort throughout the reception. 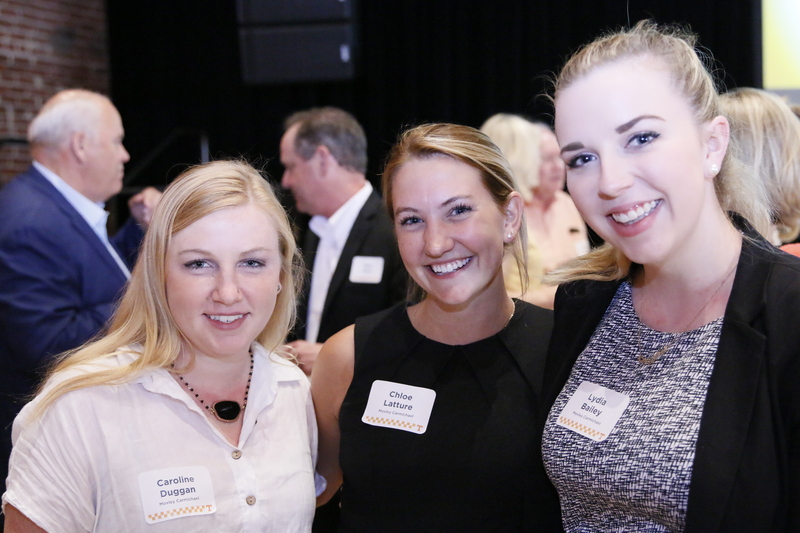 Moxley Carmichael interns, from left, Caroline Duggan, Chloe Latture and Lydia Bailey, during the reception after all guests had arrived. Lydia Bailey, a rising senior at Belmont University, had been on the job for a week at Moxley Carmichael. She was assigned to the name tag table, which requires patience, speed and attention to detail. Caroline Duggan, a rising senior at UT, also drew name tag table duties and also had been on the job for one week. “As the guests started pouring in the doors, I realized this task was much more than just finding a name tag,” Duggan said. “When guests entered the reception, the name tag table was the first stop, so we also were tasked with presenting a great first impression. I was able to interact with local opinion leaders, government officials, guests of honor and many others. “After working this event, I understand and value the importance of detailed planning. Getting names right on name tags, adding small details such as a Power T to signify access to a special sponsor reception and alphabetizing name tags make the day of show operations flow much smoother. I also learned how to politely and efficiently handle a guest that brought someone that was not on the RSVP list or deal with a missing name tag so that the line didn’t back up. Guests filled The Mill & Mine for the official welcome of Athletics Director Phillip Fulmer and Coach Jeremy Pruitt. Hammitt is scheduled to graduate in December with a degree in business analytics with a collateral in marketing. He also will earn a minor in plant science with a concentration in turfgrass. He assisted with turf management at Wimbledon in 2016 and hopes to work for the United States Tennis Association (USTA) after college. Hammitt kept his cool at one of the most prestigious tennis events in the world in London – and showed an eye for detail at the Knoxville reception. When Hammitt noticed a Moxley Carmichael staff member catching a wooden door before it shut to muffle the noise as attendees entered and left the building – and using the opportunity to welcome incoming or thank exiting guests – he moved over to help with the other doors. Hammitt didn’t need to be asked – he saw a need and filled it. Maria Cornelius, a writer/editor for Moxley Carmichael, populates the EventCheck Knox calendar. She enjoys hot summer evenings at baseball games and cold draft beer – and looks forward to cool fall afternoons and college football.